In 1975, John Cule argued that the problems facing the historian of medicine in Wales are ‘quantitatively and qualitatively different’ to those of England. Even given the ever-expanding range of sources for medical history over the past twenty years of so, and the massive impact of digitization upon the availability of source material, this remains a truism. It has long been held that Wales was a land largely devoid of formal medical practice. Instead, there remains a belief that medical folklore dominated, with cunning folk and magical healers providing the mainstay of medical provision. There are certainly strong reasons to support this view. Favourable religious conditions, laxity in prosecution, a largely rural landscape and the cushioning factor of the Welsh language, all served to provide favourable conditions for unorthodox practice to flourish. My book on Welsh medicine argued that folklore was only half the picture. The other half was of a country far less medically remote than previously acknowledged. Far from being insular, Wales was remarkably open to medical developments, both in terms of ideas, retail and consumption. The Welsh language, I argued, served to disseminate, rather than limit the spread of ideas, and a wealth of evidence suggests a thriving economy of medical knowledge, manifest in a strong culture of remedy sharing. When I began my trawl of the archives for this project, I was confident that the numbers of practitioners would quickly stack up, since no quantification had ever been attempted. After three years, however, I have managed to locate only 1300 individuals. Whilst this might sound fairly healthy, it represents the whole of Wales (with a population then of nearly half a million) between 1550 and 1740. To put it another way, there were more medical practitioners in 17th-century Bristol than in the whole of Wales. Understandably this has got me thinking. Have I simply been wrong all along? Have I overestimated the breadth and scope of medical practitioners? Was Wales, after all, really a land of cunning folk? All possible. But, I also believe that the numbers alone don’t give us the whole picture. As I want to argue today, there are reasons why we should not become over-reliant on raw statistics. To understand the nature of the Welsh medical landscape in the early modern period, it is necessary to understand the landscape itself. One of the most important factors affecting formal medicine was the nature of urbanization. In the early modern period Wales was a rural nation, with a sparse and thinly spread population. Compared to much of England, Welsh towns were extremely small. The largest town was Wrexham, with a population of around 3,500 by 1700. Most of the larger Welsh towns were between 1000 and 2000 inhabitants. This had crucial implications for the structure of medical practice. Since there were no towns large enough to sustain large groups of practitioners, there is no evidence of any medical guilds or companies. Wrexham was the only possible exception, but its practitioners apparently never attempted to formalise the practice of their trade in the town. Secondly, Wales lacked any medical infrastructure until well into the nineteenth century. There were no hospitals or medical training facilities on Welsh soil. Neither, until the 1730s, were any medical texts being printed in the Welsh language, although there was a lively trade in English medical books. Without local facilities, prospective Welsh medics needed to look elsewhere for formal education. Even here we are frustrated though since it seems that a mere handful (perhaps 10) ever darkened the doors of European medical universities, and perhaps a few score to Oxford and Cambridge. Compared to Irish medical students, who travelled in numbers, the Welsh, for reasons that are unclear, remained steadfastly put. We could simply stop here and therefore assume that we are chasing shadows. But, even a brief look at the nature of Welsh source material reveals the extent of the problem. In general terms, for example, Wales lacks many key source types – a problem familiar to Irish medical historians. Parish registers before 1700 are excellent for some areas, but virtually non-existent elsewhere. A lack of probate accounts inhibits large-scale analyses like Mortimer’s work on southern England. Wills and inventories for Welsh medical practitioners are few, rendering quantitative studies difficult. Other types of sources such as property deeds and parish registers offer statistical insights but offer little in qualitative terms. As I have mentioned, there were no medical guilds or companies. Practitioners are fleeting figures in borough records; with small towns there is less evidence for things like apprentice registers which might otherwise be revealing. What remains is an unrepresentative patchwork map of practitioners. There are simply more sources in some areas too than others. Monmouthshire, Denbighshire and Glamorganshire are all relatively well served. But for Cardiganshire, for example, I can find only three individuals in total. By any measure, this is simply not correct. If, however, the limitations are recognised, and the sources allowed to shape the research questions, it’s possible to recover a surprising amount of detail about the types of individuals engaged in medical practice in Wales, their status within local society, training, social networks etc. To get the full picture we need to look again at the question of hinterlands. In fact, I would suggest it makes little sense to regard Welsh practitioners as a homogenous group at all. Large English towns influenced each area of Wales. For south Wales it was the massive port of Bristol. 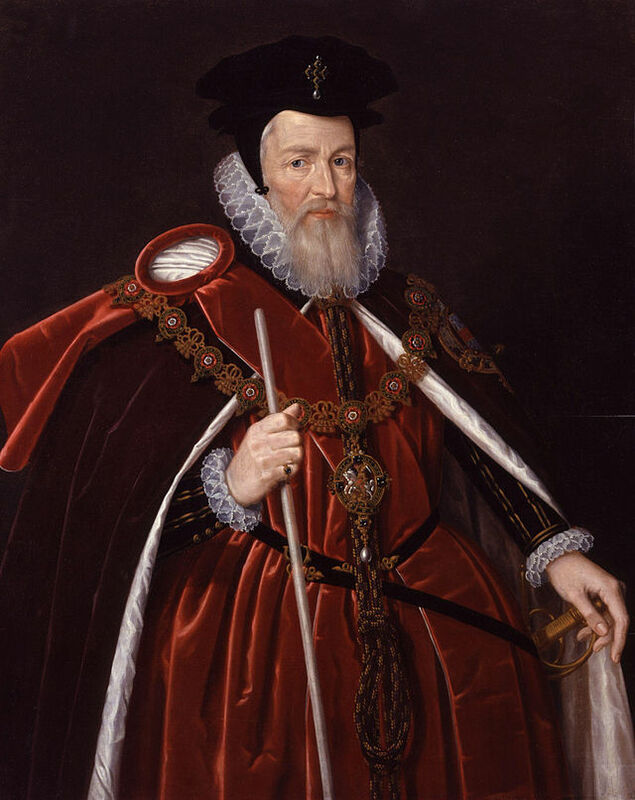 For mid Wales and the Marches, towns like Shrewsbury, and for North Wales it was Chester, each of which contained large groups of medics and, evidence suggests, strong connections with Wales. Case studies of individual towns can be instructive, rather than county studies where population density and local conditions, can vary so much. In North Wales the mighty Wrexham gives a much deeper picture of medical practice in a Welsh town than anywhere else in the Principality due to excellent records. In fact, rough patient-practitioner ratios in Wrexham are comparable to those in many large English towns. But what stands for Wrexham does not necessarily follow for Carmarthen, Monmouth or Brecon, so regional comparisons are important as far as records allow. A second thorny issue, however, is that of the nature of medical practice itself. Our evidence highlights the dangers of drawing artificial distinctions between practitioner types. Much depends on occupational titles in sources. Medicine could be a part time occupation – perhaps especially important in the case of cunning folk. It must be assumed that such people did not earn a living wage through the occasional use of charming etc. The single practitioner in the tiny Welsh hamlet of Festiniog in the 1650s can hardly have been overworked! But more broadly, tradesmen like blacksmiths often found second occupations as tooth drawers, but this duality is not reflected in the sources. Shop inventories suggest medical goods available in a range of non-medical shops. In the last analysis it may well prove true that the numbers of Welsh practitioners were lower than elsewhere. Indeed it seems logical that this was the case. But it also depends where the comparison is placed. Comparing, say, Cardiganshire with Cumberland, or parts of rural Ireland, is more realistic than comparing it to London! Many previous studies simply don’t differentiate. Equally, after effectively ignoring them in my book, it is likely that we need to put folkloric healers back in. Whatever the truth may be it is clear that numbers just simply don’t reveal the whole story. The unique characteristics of a country, nation, region, county or even town need to be fully understood before conclusions can be made. (This is a version of a paper I gave at the ‘Medical World of Early Modern Ireland, 1500-1750, in Dublin in early September 2015). 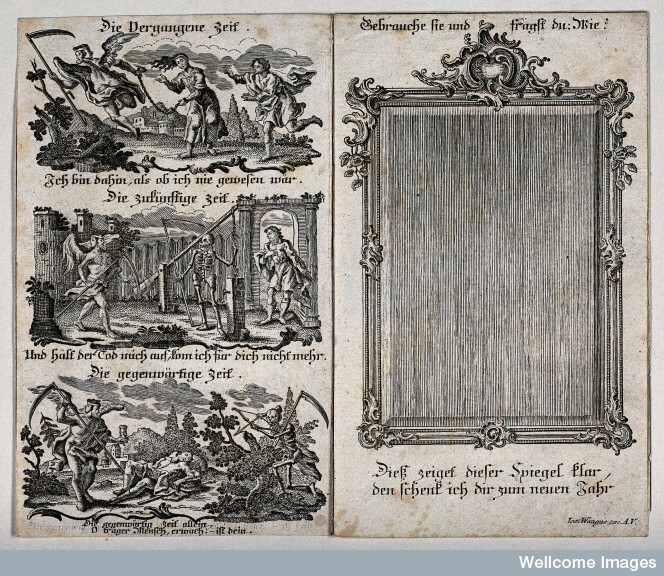 Religion & the Sickness Experience in Early Modern Britain. Over the years, a number of studies have been made of the sickness experiences of clergymen and religious figures as recorded in their diaries. One of the most well known is that of the diarist Ralph Josselin, vicar of Earl’s Colne in Essex. Another, lesser known, diarist I studied in the course of researching my book was Phillip Henry of Broad Oak in Flintshire, a puritan minister whose mid seventeenth-century diary covers a time of great religious upheaval, but also goes into great detail about his sicknesses. I also uncovered the records of an eighteenth-century Welsh Methodist preacher, who recorded the behaviours of his sick parishioners, naturally viewed through the lens of his own religious beliefs. In every case, it is clear not only how central religious beliefs were in interpreting and understanding sickness, but how individual experiences could be affected by denomination. For Puritans like Phillip Henry, for example, sickness was a test from God and it was up to the individual to interpret the message being given to them. In many ways sickness was to the body what sin was to the soul – both needed firm and definite action. As Henry wrote in 1657 “They that are whole need not a Physician…sin is the sickness of the soule, and sin-sick soules stand in great need of a Physician, and that Physician is none other than Jesus Xt”. When ill, Henry constantly monitored his symptoms and looked for causes in his behaviour. If he had a cold, he might wonder whether this was a result of the sin of pride. In other cases he felt that illness had been brought on by his over-attachment to wordly goods, or laxity in prayer. In almost every case, he viewed his body as the instrument through which God was correcting him. If anything impressed the Godly in the sickness behaviours of others it was fortitude and stoicism. If people were penitent, so much the better. The clergy were especially pleased when the sick attended church, despite their afflictions, even if they had to be carried in, and limped out! In the 1730s, John Harries, Methodist rector of Mynydd Bach and Abergorlech in Carmarthenshire, kept a journal in which he recorded his visits to sick parishioners (National Library of Wales MS 371B, Register of Mynydd Bach Chapel). Harries paid careful attention to the behaviour and comportment of the sick. When Morgan Evan Morgan ‘departed this life 23rd December 1736/7’, Harries noted that he had ‘behaved himself very sivil and sober’ despite being in a ‘lingering distemper about eight years’. Catherine Richard likewise ‘behaved herself inoffensive’, while Joyce Evan ‘was very cheerful…expected but to live, but hoped to be saved’. In other cases, however, it is clear that Harries was looking to the sick for signs he could interpret of his own destiny. When Mary John died in October 1737 he noted that she ‘relied wholly on Jesus X for her soul and behaved very patient’ but also noted that she was the first received to communion at the same time as him. As he noted, ‘I shuld take this into consideration’. Those who did not conform to expectation troubled him. When Mary Richard died in July 1742, Harries was keen to stress that ‘she was very wavering and inconstant in her profession [of faith], sometimes in and sometimes out’. M0018191 Dying man in bed. circa 1531 By: Hans BurgkmaierOfficia M.T.C. He took comfort in those whom he felt offered a glimpse into his own fate. The last moments of Ann Rees showed a woman who ‘behaved herself very lovely [and] told me a few hours before she dyed that shee hoped for salvation for God’s mercy’. Reflecting on this Harries wrote that ‘the Lord prepare me for death and judgement. I see both young and old are carried away to another world unobserved’. Constantly keeping company with the dying and dead could actually have an effect on the health of ministers. Welsh Methodists were apparently prone to depressive illness, due to their intensive introspection and concentration upon their own failings and weakness. Phillip Henry reported his unease at having attended three dying parishioners within a few days in January 1651, and worried that this was leaving him was a diminished sense of his own spirituality. Other ministers like the Manchester Presbyterian Henry Newcome, found the continual round of deathbed sittings and funerals overwhelming. But it was not only ministers who applied their religious tenets to sickness. A lucky find in Cardiff University library’s collection was a transcription of the diary of Sarah Savage, Phillip Henry’s daughter. (J.B. Williams, Memoirs of the Life and Character of Mrs Sarah Savage, London: Holdsworth and Hall, 1829). Like her father, Sarah was quick to seek the hidden meanings in her symptoms. In 1691 she was “all day at home having got an ill cold in my head”. Clearly feeling ill she fretted that “My heart was a little let out in love and praise to my Redeemer”, but reassured herself that this was “but a fit [and] soon off again”. An attack of the smallpox the following year placed her and her family in mortal danger. Her daughter Ann, also a diarist, wrote that ‘when I had received the sentence of death within myself, surely the Lord as ready to save me”. Ann also felt that the experience had taught her a valuable lesson: “the mercies, the sweet mercies which I experienced in the affliction, I shall never forget”. 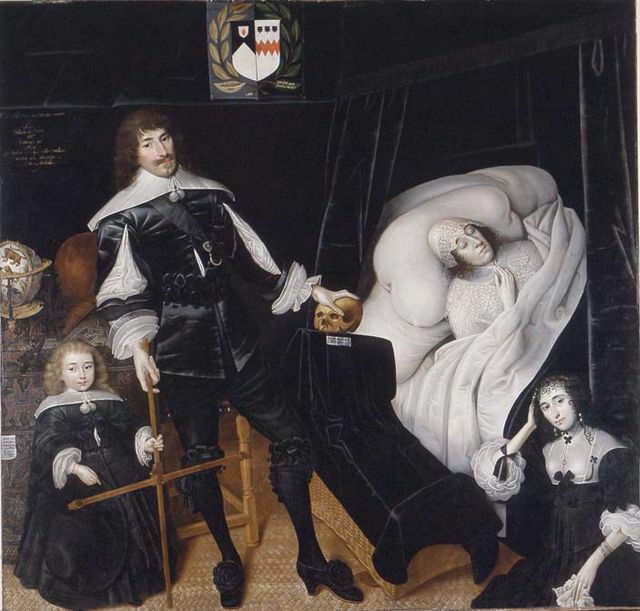 Lawrence Stone’s (now much criticised) book on early modern family life suggested that people were reluctant to invest much love in their offspring since they stood a good chance of losing them. A wealth of evidence has been put forward to refute this. Puritans, often portrayed as the most stony-faced of all Christian denominations were as troubled as anyone by illness in children. In July 1663 Henry visited a local household where a child was ‘ill of the convulsion fitts. I went to see him & O what evil there is in sin that produces such effects upon poor Innocent little ones’. 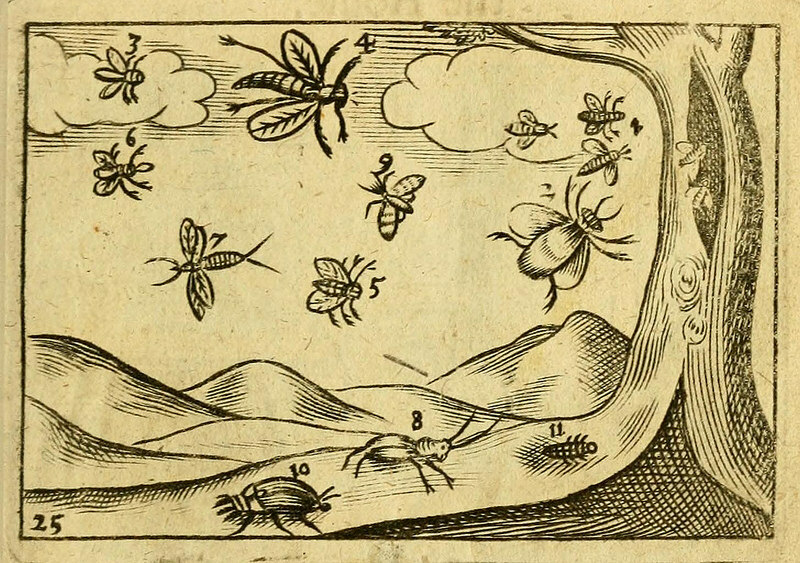 With a troubled conscience he reflected ‘if this bee done to ye green tree what shall be done to the dry?’. The head and shoulders of a ‘memento mori’ corpse. These statues were used to remind people of the transience of life and material luxury. When family members, especially children, were ill, even the strongest of faith could be tested. After witnessing the sickness of other people’s children, he was forced to confront the death of his own young son from measles. It is one of the starkest and most moving diary entries I have ever encountered, and conveys the conflict between religious conviction and a parent’s desperation. Perhaps most strikingly, Henry looks to God to show him where he (Phillip) had strayed to be punished thus. “At Sun-Sett this day hee dy’d, our first born and the beginning of our strength, a forward child, manly, loving, patient under correction. O that I could now be so under the correcting hand of my heavenly Father. Lord, wherefore is it that thou contendest, show mee, show mee? Have I over boasted, over loved, over prized? My heart bleeds. Lord have Mercy”. 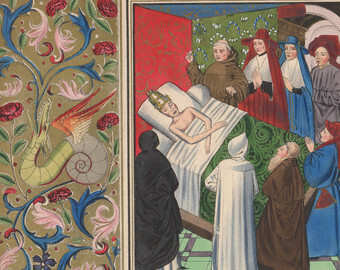 Religion was a central part of the sickness experience, and coloured not only hopes and expectations of recovery, but also the actual, physical experience of illness. Ministers and lay individuals alike, albeit perhaps to different extents, looked to God to explain how they were feeling and what this might suggest about their own conduct. The New Jersey Beard Tax and Other Strange Beard Facts! It’s ‘Decembeard’ and time to get the beard growing to raise money for research into bowel cancer. 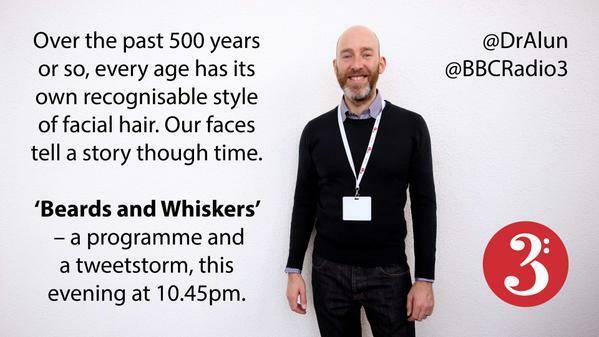 It’s a fantastic cause and, in its honour, here are some beardy sidenotes from history to get us inspired…and donating! 1) Peter the Great’s tax on beards in the eighteenth century is well known. Few people probably know that New Jersey apparently nearly had its own version in the early twentieth century. 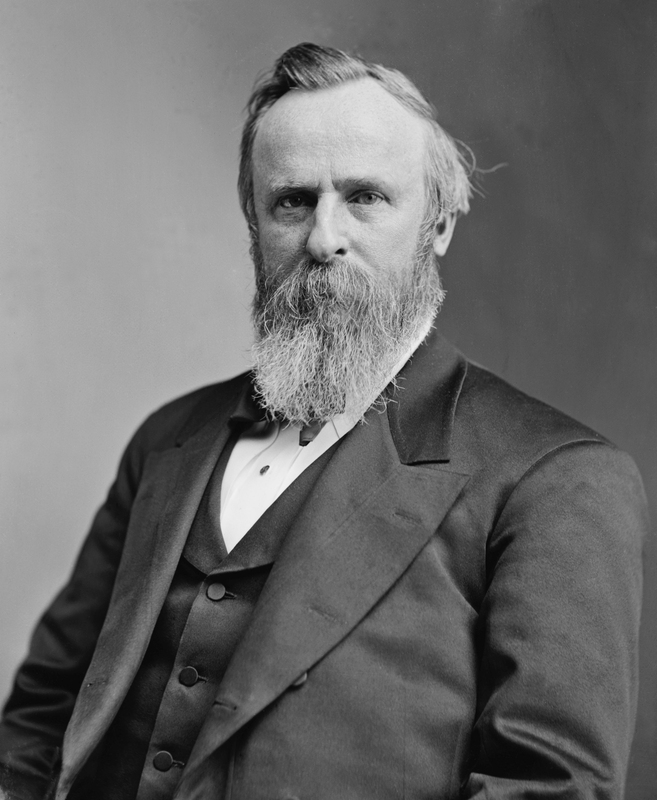 In 1907 a member of the New Jersey State Legislature introduced a bill for the graded taxation of men with beards. The mystery legislator argued that men who grew beards not only had something to hide but, worse still, grew their beards for ‘ulterior and often base motives’. The preamble to the bill pointed out that such evil ‘celebrities’ as ‘Holmes the Trunk Murderer’ and ‘Palmer the Poisoner’ were amongst prominent whisker-wearers. As far as the legislator was concerned this was prima facie evidence that beardy men were a criminal class. His proposal was for a tax on facial hair that ran along a sort of scale of what he clearly considered levels of nastiness. 2) 19th-century industrial life could even have an impact upon facial hair. In 1833, a report on workers in the cotton mills of England painted a black picture of the effects that factory life could have on the human body. Any man, stated the author of the report, who stood at noon at the exit of one of the mills and watched the denizens of the looms pour out, would be greeted by mere shadows of humanity. Underfed and overworked, factory inmates had sallow complexions, bowlegs and poor posture, raised chests and ungraceful limbs. Perhaps most interestingly, though, it was noted that their ‘hair was thin and straight – many of the men having but little beard, and that in patches of a few hairs, much resembling its growth amongst the red men of America. 3) Bearded ladies have often been the subjects of attention. 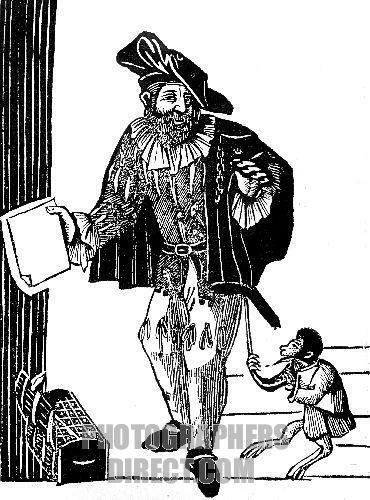 In the early modern period they might be regarded as ‘wonders’, perhaps a judgement from God relating to immoral behaviour on the part of parents. In fact, at a time when men’s and women’s bodies were viewed as being essentially the same – a woman’s body was effectively the same as a man’s…but inside out! – it was viewed as entirely possible that a woman could have facial hair as a form of extreme femininity. By the nineteenth century, though, bearded ladies were more likely to end up making a meagre living as part of a travelling ‘freak’ show. But it wasn’t just bearded ladies; there were even bearded children! In 1866, a traveling exhibition of ‘Living Wonders’ included the ‘Swiss bearded lady and here son the BEARDED BOY’, along with another mystery performer called ‘the Swiss Warbler’. The boy was reputedly 12 years old with a beard over an inch long. This may be the same boy, named as Albert Ghio, described as ‘one of the greatest curiosities of the world’ who was initiated into that most august of institutions, the Sunderland ‘Loyal Antediluvian Buffaloes’ in 1867. It wasn’t only boys either. 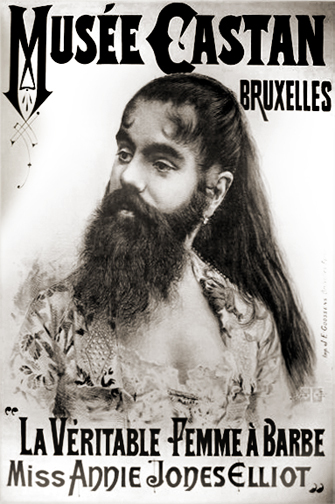 In 1877, visitors to the Hotel Province in London’s Leicester Square, could feast their eyes upon the ‘most extraordinary freak of nature in the world’ in the form of ‘PASTRANA – the Mexican bearded girl’. 4) In the eighteenth century, men were only just beginning to shave themselves. Far more common was to visit the barber to be shaved. 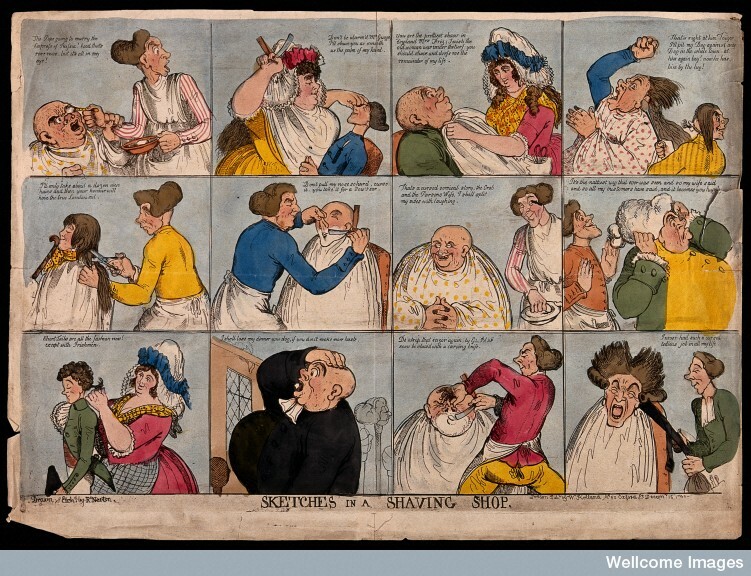 The problem with this was the discomfort that the poor ‘patient’ often had to suffer at the hands of sometimes-clumsy and cack-handed barbers. Before the introduction around the 1760s of newer, sharper types of cast steel razors, examples before then were made of steel that was brittle, easily blunted and more difficult to achieve an extremely keen edge. As such, customers complained about being shaved with blades as blunt as oyster knives, which left them with stubbly faces as well as a prodigious shaving rash! Cartoonists and satirists had a field day with country barbers. 5) Moustaches have had a long history and connection with the military. Eighteenth-century French soldiers in some regiments grew large, bushy moustaches to represent their rugged masculinity. It was no accident that burly, moustachioed recruits were often at the head of a marching column, their mighty facial hair used to strike fear into the heart of potential attackers. Another reason for adopting moustaches was inspired by the British Empire. Indian men were proud of their moustaches and were apt to mock their shaven-faced British invaders as fresh-faced adolescents. As a reaction British soldiers began to adopt moustaches as a means of enforcing authority. In 1854 the East India Company’s Bombay army made moustache-wearing compulsory and, in the 1860s, moustaches became compulsory across the British army. In fact, the order was not repealed until 1916. There was some initial resistance on the home front to the wearing of facial hair by men. For some, the adoption of facial hair was a sign that the British were “going native” and adopting foreign customs. By the 1850s, however, the ‘beard and moustache movement’ was in full flower. In the sixteenth and seventeenth centuries beard pulling was an insult as well as a common source of aggravation. In Tudor times, tweaking another man’s beard carried a fine of two shillings. Part of the problem was that, like the Persians, assailants recognised the usefulness of the beard as a beard as a useful grip. In 1896 a gang of robbers whilst shopping in Bermondsey set upon the unfortunate James Walkenden. As the man struggled to prevent his assailants from grabbing his watch and other valuables, one of the robbers spotted an opportunity and grabbed Walkenden’s beard, using it to hold his head steady while he punched the man in the face. At this point it’s also worth mentioning Edward Wingfield of the James Fort, Virginia, involved in a firefight with local Indians in 1607. Overwhelmed by ‘over 200 savages’ Wingfield was part of a cadre of eleven men trapped in the fort, whose situation looked precarious. Sporting a large beard he made a seemingly easy target for a sharpshooter. But he was lucky. The Indian gunman aimed too low, missing Wingfield’s face, but shooting straight through his beard. This left him with a round hole in his beard and, no doubt, a story to tell his grandchildren! 7 ‘Curious Particulars’: Useful knowledge in the 18th Century. 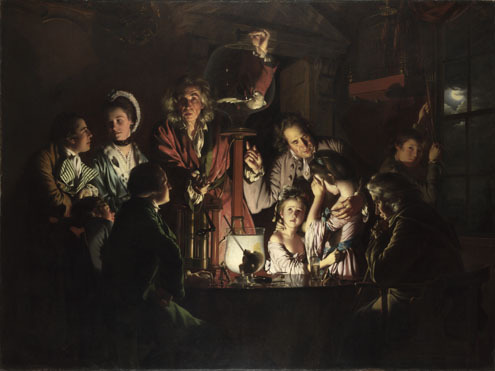 The eighteenth century brought with it a new interest in science and, perhaps more importantly, brought science into the public domain for perhaps the first time. 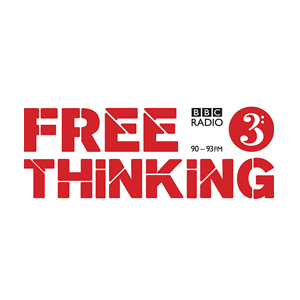 Whereas scientific experiments had once been the domain of dilettante gentlemen, locked away in august institutions such as the Royal Society, more people were becoming aware of just how interesting – and indeed fun –science could be. Public demonstrations were one means through which people could learn about the latest ideas and inventions. Visitors to the Isaac Newton’s Head public house in London in 1748, for example, could marvel at Francis Watkins’ ‘lately finished and most complete Electrical Machine’. For sixpence they could purchase their own account of all the electrical experiments lately carried out in the Royal Society. In Hart Street, Covent Garden in 1784, amazed onlookers could view marvellous and curious inventions such as the ‘mechanical bird’ of which ‘nothing similar was ever presented in the world’. Mr Cox’s London Museum offered visitors such pleasures as the mechanical machine that played God Save the King. Alongside this, however, were books of useful knowledge which began to include directions for people to conduct their own experiments. Books of this sort had been around for a long time, often aimed at women and including lots of medical information, along with domestic knowledge, from cleaning pots and pans to directions to make washballs. But the emphasis upon science, and also upon systems of classification, brought diverse types of recipes together, covering everything from medicine and domestic life to experiments designed for no other reason than to entertain onlookers! 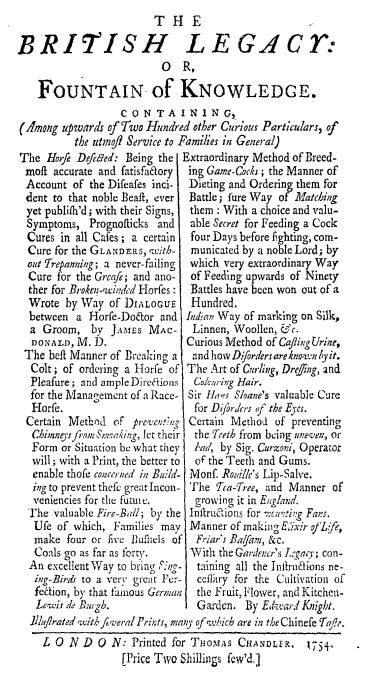 One such volume was The British Legacy: or fountain of knowledge, printed in 1754, and which contained ‘upwards of two hundred other curious particulars of the utmost service’ to the ‘Gentleman, the Scholar, the Mechanick and, in a word, every member of society so deeply interested in the Improvement of Arts and Sciences’. “Besides upward of two hundred Miscellaneous articles of great, nay inestimable value” the reader was promised “the most useful treatise on Farriery ever published”, and well as a ‘certain cure for the Glanders’. What, then, was amongst this panoply of knowledge? Here’s ten items to give a flavour of what the informed Georgian might find useful. Take a quantity of water cresses and boil them in clear water for fifteen minutes, strain them off, and drink about half a pint of the decoction every now and then, about milk warm. The flux referred to severe diarrhoea, which was still a common and dangerous problem during this period. Medical remedies for the flux abounded in the early modern period, and belonged to a long tradition of recipe sharing. In fact water cresses can be found in recipe collections for diarrhoea well over a century before this date. Including medical recipes fitted well with the concept of medicine as useful knowledge of the sort it would be useful to keep handy. One ounce of Camphire, two pounds of hog’s lard: dissolve them together and take off the scum; mix as much black lead as will bring them to an Iron colour; rub your Arms &C over with this and let it lie on 24 hours: them clean them with a linen cloth, and they will keep clean many months. This one might appear strange but, in fact, rusting metal was a constant problem. Before the invention of stainless steel in the later nineteenth century, iron and steel was extremely prone to rusting. Imagine the scene; you’re awoken in the night by housebreakers. You fumble around for your pistol, which has been hanging around for years in a damp room, only to find the mechanism rusted and seized. Keeping metal goods of all sorts polished and rust free was important, and lots of commercial preparations were available to keep iron and steel from rusting. Mix with the solution of Vitriol, the Pulp of Colquinta, and apply the mixture to all the crevices which serve as a Nursery to vermin; the Solution alone has prov’d effectual; but if apply’d to stone or brick walls, it may be mix’d with lime, which will give it a lively yellow, and insure its success. Here again, in houses often infected with cockroaches, bedbugs and lice, anything to mitigate the problem was welcomed. The attribution to the eminent Mr Selberg was a common device, often used in medical recipes, to give weight to the provenance and efficacy of the recipe. Sweet sublimate one drachm; cream of Tartar one ounce, Let these infuse two or three days in a pint of Spring Water; then bathe the parts broke out therewith, Morning and Evening, for four or five days, and the Cure will be completed. Mix a quantity of the spirit of Nitre and Oil of Cloves, the least drop of the former is sufficient; as to Quantity in the latter you need not regard; for, when mixed, a sudden Ferment, with a fine flame, will arise; and sometimes if the Ingredients be very pure and strong, there will be a sudden explosion like the report of a Great Gun. As an afterthought, the author included the following public health warning! “It is a little dangerous to the person who undertakes the experiment, for when the effluvia of acid and alkaline bodies meet each other in the air, the fermentation causes such a rarefaction as makes it difficult to breathe for all those who are near it”. 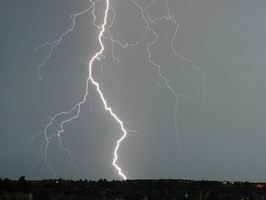 The very next recipe was one ‘To make an artificial earthquake”, which involved 20 ounces of sulphur which, it was promised, after eight or ten hours buried in the ground would ‘Vomit flame and cause the earth to tremble all around the place to a considerable distance”. Don’t try this at home kids! Fine silver one ounce; Aqua Fortis and Mercury, each four ounces; in this, dissolve your silver in a vial, put therein a Pint of Water, close your Vial, and you’ll have a curious Tree spring forth in branches which grows daily.